Registration is now open for the 2016 summer meeting. Register before May 17 to receive the early bird discounted rates. Click here for more information. The summer meeting agenda preview is now available online. Click here to view agenda. 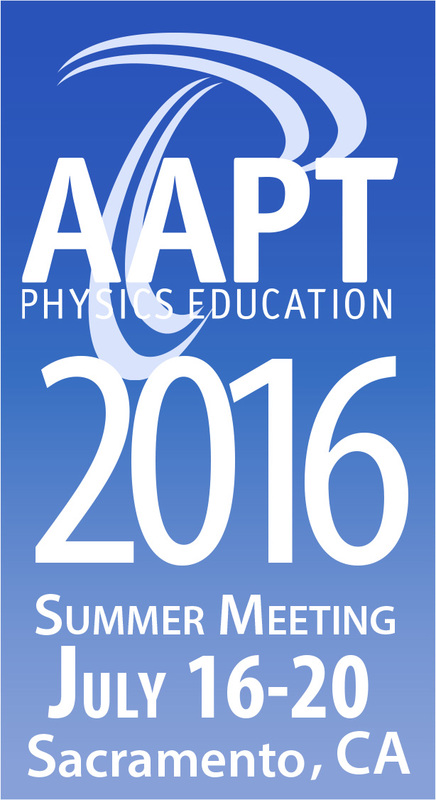 A special day has been prepared on Monday, July 18 for high school physics teachers that have never attended a national AAPT Meeting. Qualified teachers will receive a discounted registration fee of $85. Please click here for more information. AAPT members: There’s still time to recognize the excellence of your students! Don’t forget, as an AAPT member, you are eligible to participate in one of our most popular awards program. The deadline for all awards is June 30th! Visit the awards page at AAPT.org to submit your nominees. AAPT has added an updated privacy statement to its website. A link to the document can be found at the bottom of each page next to the copyright link and under the About tab in the navigation bar at the top of each page. Did you know that AAPT has co-sponsored seven career development webinars for its members? The 30th anniversary celebration of the U.S. Physics Team program is scheduled for May 27 - 28, 2016 in Washington D.C. A panel discussion with NASA leaders, Michelle Thaller and Ellen Stofan is planned. Dr. Sylvester James Gates will be the guest speaker at the celebration dinner, as well as a number of other festivities. Click here for more information. 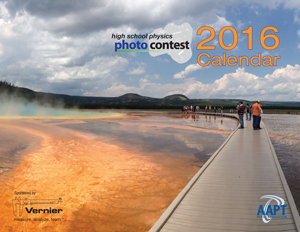 It's not too late to register for the 2016 AAPT High School Physics Photo Contest! This is the perfect opportunity for your students to combine what they've learned in physics with their artistic side. Photographs can be entered in one of three categories: natural, contrived, or multiple images — for a chance to win a $100 cash prize. View the 2015 winners. The deadline for submission is May 15. Learn more! 2016 AAPT PhysicsBowl Contest Results! Results for the 2016 AAPT PhysicsBowl Contest will be available early May. Check Results Here!. The 2016 Physics Department Chairs Conference will be held June 2-4 in College Park, MD. Physics and Astronomy New Faculty Workshop, June 20-23, 2016 in College Park. Help send your students to PhysCon November 3-5, 2016 in Silicon Valley, CA. Renowned speakers include Jocelyn Bell Burnell and S. James Gates. Site tours of SLAC, NASA Ames, and Google X are confirmed. Fundraising kits are available for Society of Physics Students chapters. Don't miss this rare opportunity! The National Science Foundation STEM Video Showcase is happening May 17-23, 2016. The virtual event featuring more than 150 short videos highlighting innovative programs and advances in STEM teaching and learning is free and open to the public. I am hoping that you could help us extend an invitation to your members and encourage them to join the thousands of practitioners, researchers, industry leaders, scientists, parents, and students who will browse these videos and discuss them online with the presenters beginning May 17. Find more information on the event at visit stemforall2016.videohall.com. In the brief video at the top of the page, presenters discuss the benefits of engaging in the virtual space. Discover what a speech says about you, how to prepare, how to combat anxiety, and how to show confidence and poise. Moderator Alaina Levine will coach you LIVE, face-to-face, on-camera! Speaking, articulation, and projection techniques; interaction with the audience; and presentation issues specific to scientists/engineers and for science-based conferences are addressed. To access recorded versions of career development webinars on topics such as interviewing, networking, and poster presentation, visit www.aapt.org/Resources/webinarlanding. The Partnership for the Integration of Computation into Undergraduate Physics (PICUP) would like to invite all physics faculty to the following workshop. A week-long (Monday, August 1-Friday, August 5) Faculty Development Workshop will be held on the campus of the University of Wisconsin at River Falls, to facilitate participants to develop their own computational educational materials, and to formulate a plan for implementing these materials in their upcoming courses. All local expenses will be covered for participants at the River Falls Workshop, and there may be some limited funding for round-trip travel to River Falls. See www.gopicup.org for more details on these workshops and other PICUP events. Designed for those who teach introductory physics at universities, colleges and high schools. Graduate credit will be available through the University of Oregon. * Instructors: Priscilla Laws, Dickinson College, David Sokoloff, University of Oregon, Ronald Thornton, Tufts University. The course fee is $200.